The following case is used on The Black Vault with permission from the author/investigator. It can not be reproduced in any way without contacting Mr. William Puckett. Background: 2 Washington State Department of Corrections (DOC) Officers saw bright orange lights for around 50 seconds between 9:52 and 9:57 PM on Oct 18, 2015. The lights were sighted in a southwesterly direction. The lights were larger than yard lights and were about 25 to 30 degrees above the horizon. The officers were traveling south on Highway 395 between Connell and Mesa, WA. James Clarkson MUFON Director for Washington State received the sighting report and requested assistance with analysis of radar data. In response to this request I wrote a Freedom of Information Act (FOIA) to the Federal Aviation Administration (FAA) requesting aviation radar data for the Pasco, WA (Tri-cities) area. I received the radar data submission from the FAA about 2 months later (December 18, 2015). The FAA provided the data that I requested. 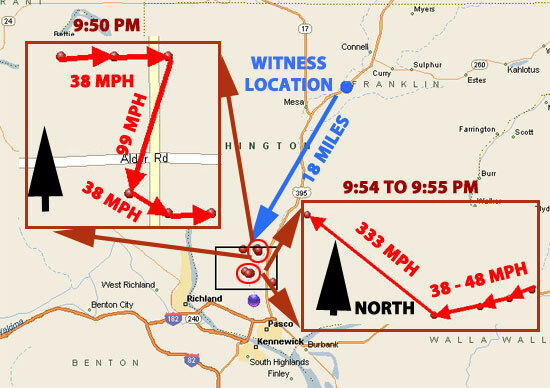 FIGURE ONE – WITNESS & LOCATIONS OF 2 RADAR SITES. Notes on Radar Data: The radar data were received for Pasco, WA Traffic Control and a NTAP (National Transportation Analysis Program) was also received. 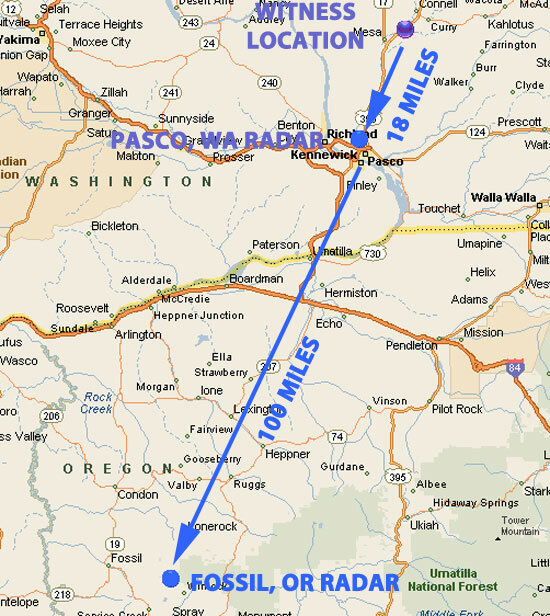 The NTAP included a long range radar from Fossil, Oregon which is about 100 miles south of Pasco, WA and the Pasco, WA Traffic Control radar. (See Figure One to the left). The closest returns on radar were about 18 miles to the southwest (near Pasco, WA airport). (See Figure Two below.) The interesting thing about the data in Figure Two is that the Pasco radar report listed that returns were “target reports.” This suggests that data were filtered and weather returns, gr0und traffic, birds and radar angels were removed. 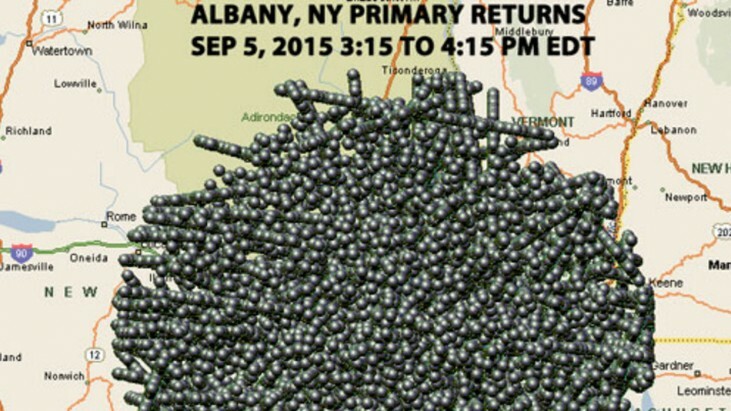 This suggests that the remaining returns were actual moving aerial targets. All of the primary returns are shown in Figure Two below. A typical “unfiltered” radar map is shown in Figure Three below. The radar map in Figure Three is for Albany, New York. You can see A “conglomerate” of returns and it is difficult to determine real moving targets while Figure Two shows small patterns of returns. We can’t definitively say for sure if the radar picked up the objects seen by the witnesses, but we can say that radar returns were in the direction (southwest) and at the time (9:50 to 10 PM) that the witnesses saw the objects. 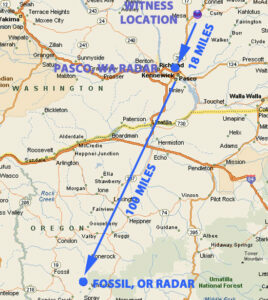 The radar returns were around 18 miles from the estimated witness location and near the Pasco radar. (See Figure Four below.) Figure Four shows the area of returns and a zoom in showing the speed and direction of movement of the returns. The zoom in box to the left is for returns detected from 9:50 to 9:51 PM. For the box to the left there were six radar returns in sequence. The target was moving slowly east, then abruptly changes direction to the south-southwest at a higher speed and then turned east-southeast at original speed (38 MPH). One can’t say for sure if each return represents the same target, but the targets were in sequence with each turn of the radar antenna. The targets were not detected after 9:51 PM. FIGURE TWO – ALL RETURNS 9:30 TO 10 PM – OCT 18, 2015. The zoom in box to the right shows returns from 9:54 to 9:55 PM. The box to the right fits more closely with the witness observation time. Again the speed of the target is slow (38 to 48 MPH) and moving to the west-southwest. The target then turned direction to the northwest and nearly increased it’s speed tenfold. Again we can’t say for sure if this is one target, but it fits with the radar antenna rotation sequence. The direction of movement (westerly direction ) fits with what the witnesses saw. The targets were no longer detected after 9:55 PM. Of course the targets could have been multiple targets, but may have showed up as one target on the radar scope if they were close together. The witnesses observed multiple targets. There were also returns noted in the same area observed by the witnesses before the sighting time, but the witnesses would not have been in position to observe the returns. Doppler weather radar data were collected from Portland, Oregon and Spokane, Washington. Both of these radars reach the Pasco, WA area. Some light showers were observed a few hours prior to the sighting. Skies were clear at Pasco Airport at the time of the sighting. The Doppler radar maps did not show anything unusual. The radar sites did show some scattered showers, but the area was well removed from the sighting area. However, Doppler radars are not designed to detect aircraft. The radars have a narrow beam width (one degree) which means that objects will not be detected unless they happen to fly through the narrow beam. 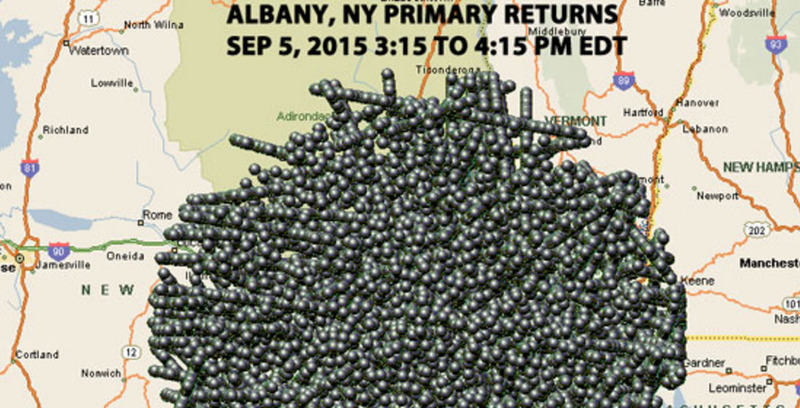 FIGURE THREE – MAP OF ALL PRIMARY RADAR RETURNS ALBANY, NY 9/5/2015. Using trigonometry the width of the object would be around 1,650 feet if what the witnesses saw was detected by radar. For comparison purposes the length of a 747 aircraft is 231 feet with a wingspan of 211 feet. Using trigonometry if the radar returns represented the object, the elevation would have just over 44,000 feet. If the returns represent what the witnesses saw the objects would have been quite large and would have been very visible from the Pasco, WA area. The fact that the time of the sighting was late (around 10 PM on a Sunday night before the week) and the fact that the objects were only visible for a short time may have resulted in fewer (in any) witnesses. Also there is a possibility that the objects may have appeared larger to the witnesses due to light scattering in the atmosphere which can make objects appear bigger. This is particularly true if objects are lower on the horizon (25 degrees or lower). FIGURE FOUR – MAP & ZOOM IN OF AREA OF RADAR RETURNS. 2 DOC officers saw 2 large orange objects to the Southwest while returning home from work around 10 PM on October 18, 2015. The officers were near Connell, WA and were returning to the Tri-Cities area. The officers had never before or have since seen the lights. The lights were near the Hanford Nuclear Facility in Richland, Washington. Radar targets were detected in the direction and times when the witnesses saw the objects. The distance was large (around 18 miles). The radar targets were only visible for 2 periods of time (9:50-9:51 PM & 9:54-9:55 PM) of around one minute. This is consistent with the brief time that the witnesses saw the objects. The radar targets were in a southwesterly direction which is where the witnesses saw the objects. The targets were moving in a westerly direction at speeds of 38 to 48 MPH and then accelerated to over 300 MPH before vanishing from the scope. The radar detected this from 9:54 to 9:55 PM. This is consistent with the direction of movement reported by the witnesses and closest to the time (9:52 to 9:57 PM). If the targets represent what the witnesses saw the objects would have flying around 44,000 feet and would have been over 1,500 feet in width. The witnesses saw multiple targets. Perhaps the targets were so close to one another that the radar only painted one return? The targets were close to Pasco Airport. One would think that others would have witnessed the objects if the radar targets represented what the witnesses saw due to their large size and proximity to the Pasco area.